As unappetizing as that may sound, my parents and I (well, okay, just me) watched Hairspray Saturday night. My friend lent me the movie, and I wasn't planning on watching it until after finals, but I figured Saturday night relaxing was just as good a way to spend it as any. Of course, because this is my family, we started watching the movie at 8:30 and we usually are in bed before ten, so my parents both fell asleep before the movie was even halfway through. I, though, can't seem to fall asleep during movies unless I'm extremely exhausted or sick, so I saw it all. But if I was only watching a movie (which I did end up liking), then why am I bothering to even write about it? Oh yeah, because of what happened the few hours before the movie. And part of the reason why instead of watching it at seven like I had hoped for, we watched it later. I decided I'd finally make Heidi's spiced caramel corn. The one that said "hey, try me!" when I was flipping through the pages of Super Natural Cooking, even though I've never been a big fan of caramel anything. Something strange has been happening. Of course, I'd returned the book to the library weeks ago (maybe months now) and didn't have the recipe. So the internet came to rescue. Or at least Amazon letting me peek inside the book so I could read the recipe, not that David Lebovitz didn't have a perfectly respectable copy of it. I just wanted to read the recipe next to the mouthwatering picture. Though had Amazon not let me peek in the book, I'm sure I would have followed his. That was the easy part. Then came the popping the popcorn. This is not my first time popping popcorn, and it really isn't all that hard. I just somehow managed to burn the teaspoon of oil to the bottom of the pan because I couldn't remember if I'd used oil last time or not, and if I had, I know it hadn't been much. Dad said not to bother, but I didn't heed his warning. And at the same time I was burning the oil to the pan, I burnt the nuts I was toasting in the oven that Dad was preheating for his lamb chops. Oops. At that point, with a burnt smell overtaking the kitchen and replacing what should have been pleasant smells emanating from Dad making dinner, I announced that we were not having popcorn with the movie. Somehow, without being harsh, Dad managed to motivate me. He wasn't upset about the pot and was sure after a soak it would be fine, and told me, "At least you tried to make it. That's more than most people your age would do." I had to make it. I just had to. But without ruining anything else or burning down the house. I did still have enough nuts left, and I hadn't used up any of the popcorn yet. So I tried again. Except the nuts went into their own oven, not the one that now contained the lamb, and at 350F so I could keep a closer watch on them. Or maybe it was 325. And I set the time for three minutes intervals until they were ready. Then it was time for dinner. But after dinner I yanked Alton Brown's book off the bookshelf, flipped through it for the microwave popcorn instructions I knew it contained and rummaged through the kitchen for a paper lunch bag. Thank goodness for 12th birthday parties. I found the stapler, and a couple minutes later I had popped corn! 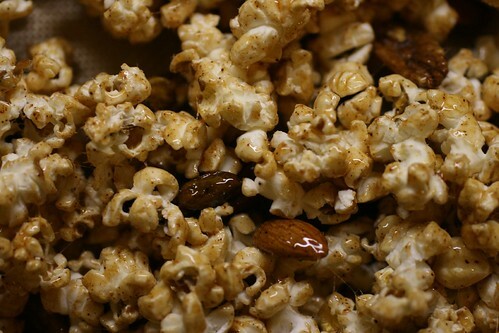 No burnt stuff and very few unpopped kernels. It was like magic. Or you know, science. So then the recipe went without a hitch. Though Mom and Dad keep asking me if there's ginger in it, and while it tasted like it, I swear there isn't. I didn't follow her instructions for popping popcorn because of the incident with the pan mentioned above. Somehow I've made popcorn on the stove before, and it was almost as simple as in the microwave. But this didn't require waiting to get the pot clean. 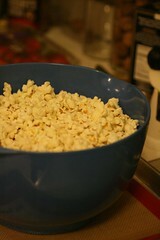 To make popcorn in the microwave, take a clean standard-size brown paper lunch bag. Put about 1/4 to 1/3 cup of kernels inside the bag. Fold the top of the bag 1/2" over twice to close and place two staples about 3 inches apart on the folds. Place in the microwave (as long as it has a turntable) making sure the staples will not touch the walls. Press microwave button or microwave on high for 2 to 3 minutes or until there are five seconds between pops. I chose not to put the recipe up because she never replied to my e-mail. or if she did it got lust in the glut of e-mails I've been receiving from colleges. 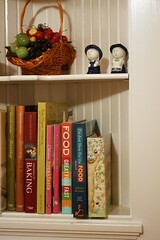 But David Lebowitz has a copy of the recipe up, and there's a link above. 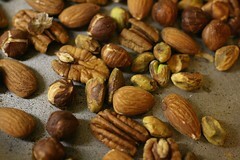 I used a mix of pistachios, pecans, almonds, hazelnuts, and walnuts - I think that's the only difference.